Rediff.com » Movies » Bajrangi Bhaijaan inspired from Alice In The Cities? Bajrangi Bhaijaan inspired from Alice In The Cities? While everyone applauded Kabir Khan’s Bajrangi Bhaijaan wholeheartedly and never questioned its originality, it seems the film does bear some uncanny resemblances to German auteur director Wim Wenders’ 1974 film Alice In The Cities. The Indo-Pak angle in Bajrangi Bhaijaan is original. But the basic plot line of a man left with a lost little girl whom he must take back home, seems very similar to Wim Wenders’ film. Alice In The Cities is about a German writer (played by Rudiger Vogler) who is left to care for a little girl by her mother. When the mother doesn’t return, the writer must take the girl to her grandmother. But the little girl knows next to nothing about her grandmother’s address. Of course, the resemblance could be coincidental. 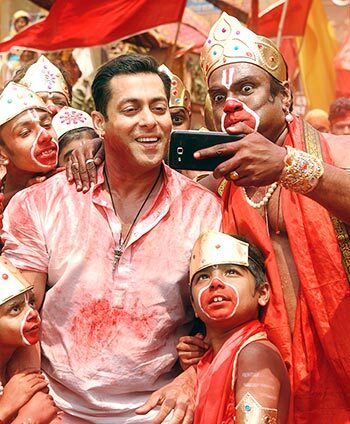 No matter what the source of inspiration, we cannot deny the strong content and powerful message was the reason behind Bajrangi Bhaijaan's super success. Quiz: Which actor passed away during the filming of Desh Premee?